The wurm returns next month. 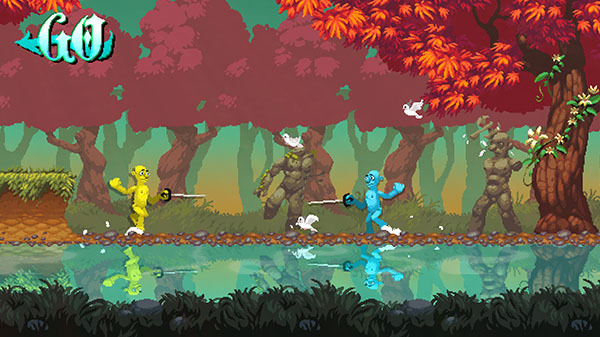 Nidhogg 2 will launch for PlayStation 4 and PC on August 15, developer Messhof announced. PlayStation 4 pre-orders will begin on July 18. The next installment of the epic award-winning dueling tug-of-war is coming! Stab, shoot, slice, or stomp your opponent to gain control of the screen, then book it to your side of the arena. Before long, a new opponent will appear in your way. If they kill you, they get control. Get all the way to your end of the arena to win–and be devoured by the Nidhogg. Enjoy new monstrous visuals by artist Toby Dixon and bangin beats from Mux Mool, Daedelus, Doseone, and more! New Weapons – Use all new weapons like the bow and arrow, long sword, and knife in addition to the familiar rapier to dispatch your foes. Some weapons favor close range and others, like the bow, can be used safely from a distance. A New World – Battle it out over 10 totally unique arenas from castles, to flying ships, to inside a Nidhogg’s guts. Use the environment to your advantage! Play Online – Play through the single player, duel your friends on local couch coop or play matches online! Over at the PlayStation Blog, Messhof creative director and co-founder Mark Essen detailed the creative process behind Nidhogg 2, including why the studio built a completely new art style for the sequel.